Media and Contents: Soft cover, 196 pages plus 4 pages of maps.. Although the Vietnam War was burned into the consciousness of Western television audiences during the 1960s and 1970s, hostilities really commenced almost immediately at the end of the Second World War. In September 1945, Ho Chi Minh proclaimed the Democratic Republic of Vietnam. Within weeks, however, the country was once again under occupation - this time by British and Nationalist Chinese forces - in preparation for the restoration of French Colonial rule. Despite a brief respite, Ho Chi Minh's Viet Minh commenced a campaign against French forces in 1946. The United States supplemented France's ageing armour units upon the outbreak of the Korean War, and the new state of Communist China represented a source of assistance and equipment to the Viet Minh. By 1954, France had lost possession of her colonies in Indo China and Vietnam had been divided along the 17th Parallel. Much of the departing French's antiquated armour was transferred to the new South Vietnamese Army. American military advisers began arriving as early as 1956, but armour played only a minimal role until 1962. That year saw the arrival of the first M113 Armoured Personnel Carriers. 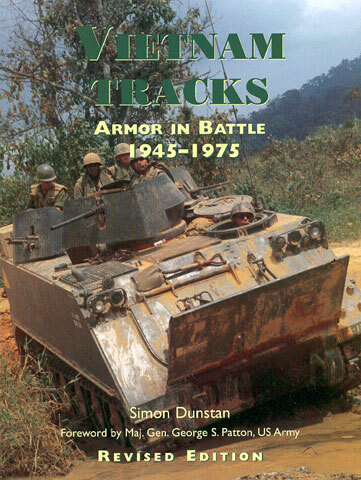 Simon Dunstan's book, Vietnam Tracks - Armor in Battle 1945-1975, covers armour activity of all protagonists for this entire turbulent period. French Armour in Indo-China is described in the first 35 pages, followed by Armour of the South Vietnamese Army. The bulk of this title is devoted to US Army and Marine armour and their operations, with additional separate coverage of Australian and North Vietnamese armour. The text is interesting and readable, with a good mix of historical and operational context to support the main subject. Additional resources between the covers include organisational charts, tables and four full-page maps. Osprey's "Vietnam Tracks" is an interesting and informative text with terrific photographic support on the subject of armour in Vietnam from 1945 to 1975. This book will find a useful place on the bookshelves of Vietnam history buffs and modellers alike.